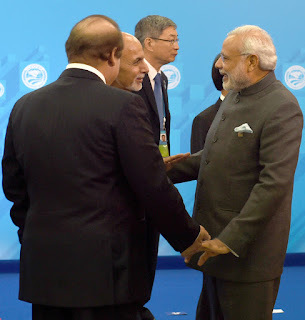 The Prime Minister, Shri Narendra Modi with the Prime Minister of Pakistan, Mr. Nawaz Sharif and the President of Afghanistan, Md. Ashraf Ghani, at SCO summit, in Ufa, Russia on July 10, 2015. The Union Home Minister, Shri Rajnath Singh said that India-Pakistan joint statement at Ufa, Russia today shows signs of positive movement and both the countries engaging at different levels will hopefully open new possibilities. Shri Rajnath Singh said that I welcome the decision taken by India and Pakistan to expedite the trial pertaining to 2008 Mumbai attack including additional information like providing voice samples. The India Pakistan joint statement is a step forward towards normalising bilateral relations, however the future outcome will be keenly watched, he added. The Union Home Minister further added that the Meeting of the Director General, Border Security Force and the Director General, Pakistan Rangers will also help in stablising the situation at the India-Pakistan border. I congratulate the Prime Minister, Shri Narendra Modi for his statesman like approach and engaging Pakistan on diplomatic level. The Union Cabinet Secretary Shri Pradeep Kumar Sinha reviewed the Left Wing Extremism (LWE) scenario in the country with the Union Home Secretary Shri LC Goyal and the Secretaries of Tribal Affairs, Rural Development, Environment & Forest, Road Transport & Highways and School Education & Literacy. Officials of Ministry of Defence, Intelligence Bureau, Central Reserve Police Force and National Security Council Secretariat also attended the meeting. The Chief Secretaries and Directors General of Police of LWE-affected States participated in the meeting through video conferencing. The Cabinet Secretary reviewed the progress of various developmental and security initiatives such as installation of mobile towers, construction of roads under the Road Requirement Plan-I (RRP-I), construction of fortified police stations in LWE States, filling up of police vacancies, raising of Special India Reserve Battalions, forest clearances, claims of title deeds under the Forest Rights Act, opening of new schools and hostels, training of youth for Skill Development under ROSHINI and priority to roads in LWE areas under the Pradhan Mantri Gramin Sadak Yojana. After detailed deliberations, the Cabinet Secretary directed the various Ministries to expedite the completion of the ongoing projects in LWE areas. The Union Home Minister, Shri Rajnath Singh will be Chairing a meeting of the Chief Ministers of Northeastern States and Sikkim at Guwahati, tomorrow. The Minister of State for Development of North Eastern Region (DoNER), Dr. Jitendra Singh, the Minister of State for Home Affairs, Shri Kiren Rijiju and Union Home Secretary, Shri L.C. Goyal will also participate in the meeting. During the meeting, security related issues including, counter insurgency operations, suspension of operations agreement, effective functioning of anti-extortion cells and strengthening and equipping of State police forces of the region will be discussed. The participants will also discuss effective guarding of international borders adjoining Northeastern States. In addition, important development projects and flood and landslide situation in the region will also be reviewed during this meeting. 4) Amendment of Bonus Act – Removal of conditions on payment ceiling, eligibility limits, decisions to pay minimum bonus without linking to loss when the performance indicator satisfy grant of bonus. The Standing Labour Committee (SLC), a tripartite body is a pre-cursor to the Indian Labour Conference(ILC). As a matter of practice, and to maintain continuous dialogue with social partners, meetings of these apex bodies are convened once in a year to discuss the topical issues concerning labour. All the 12 Central Trade Union Organisations, Central Organisations of employers, all State Governments and Union Territories and Central Ministries/Departments concerned with the agenda items, are the members of the ILC and SLC. The meeting has been convened as a pre-cursor to the 46th Session of the Indian labour Conference to be held on July 20-21, 2015 in New Delhi. Shri Bandaru Dattatraya, Union Minister of State (Independent Charge) for Labour & Employment today Unveiled “ Nidhi Aapke Nikat”, a public outreach program of EPFO at Delhi (South)Regional Office, Dwarka. Speaking on the occasion, Shri Dattatraya said that in tune with the PM’s vision and mission of Shramev Jayate, it had been the endeavor of the government to provide world class services to the nation’s workforce. Stressing the need to work on ‘Make in India’, ‘Digital India’ and ‘Skill India’ programmes, he said measures to ensure transparency and accountability were imperative to usher in a corruption free India. Referring to customer friendly initiatives taken by EPFO, he hoped that EPFO would become the number one social security organization in the world. He said ‘Nidhi Aapke Nika’t programme would increase stakeholders participation, not only by addressing their grievances but also inviting their suggestions and views. Shri Shankar Aggarwal, Secretary, Labour & Employment, said that the focus in the coming time shall be on ways and means to reach the EPF member and employer through e-mode. He said that the ultimate objective should be to provide all public services to the citizen on 24X7 basis harnessing the latest IT tools. Shri K.K. Jalan, CPFC said that Nidhi Aapke Nikat besides being an outreach programme was also an occasion to introspect within the organization and invited members and employers to contribute to the better functioning of the organization. The grievance redressal in EPFO occupies a centre stage in the organization’s activities. In addition to prompt action on complaints, an online facility namely EPFiGMS (Employees’ Provident Fund internet Grievance Monitoring System) has also been made available on EPFO website. Recognizing the changed ground realities, EPFO has introduced Nidhi Aapke Nikat as a public outreach programme to reach out to all its stakeholders including employers. The programme will be presided over by the Officer-incharge in every office of EPFO. Moving away from a pure grievance redressal centered approach, Nidhi Aapke Nikat would encourage a more participatory and broad based involvement of all concerned. This would serve as a platform for both employers and employees to not only air their grievances but also to put forth their constructive suggestions. Also, Nidhi Aapke Nikat would be an occasion to sensitize all the stakeholders about the multitude of new initiatives and programme launched by EPFO in their interest. Separate and specific time slots are allotted to different stakeholders like subscribers, employers and exempted establishments so that exclusive attention can be bestowed. Trade unions and employers associations are approached prior to the programme for eliciting details of any particular issue or problem which demands immediate attention so that the same can be successfully resolved during the programme. Ministry of Steel and Ministry of Mines signed Memorandum of Understanding (MOU) with Ministry of Skill Development & Entrepreneurship, for cooperation on Skill Development in New Delhi today. The Minister of State for Skill Development & Entrepreneurship (Independent Charge) and Parliamentary Affairs, Shri Rajiv Pratap Rudy said that steel and mines are two important sectors where skill development potential exists. He expressed gratitude to Shri Tomar for extending support to meet the incremental requirement of manpower in these sectors. Senior officials from the Ministries were present during the MOU signing ceremony. The MoU was signed by Shri Upendra Tripathy, Secretary, Ministry of New and Renewable Energy from Indian side and by Shri Richard Verma, United States Ambassador to the Republic of India from USA side on 30th June, 2015 at New Delhi. The Government of India and the United States of America have announced the launch of a new initiative “Promoting Energy Access through Clean Energy (PEACE)”. This ambitious cooperation is a new tract under the U.S.-India Partnership to Advance Clean Energy (PACE), a flagship initiative on Clean Energy that combines the resources of several U.S. agencies and GOI Ministries. This has also been listed in the Joint Statement during the visit of President of USA to India in January, 2015. India-U.S. corpus of about Rs.500 Million ($8 Million U.S. Dollars) have been drawn on 50:50 sharing basis. Under this, a Steering Committee comprising the Secretary of the Ministry of New and Renewable Energy and the United States Ambassador to India, and three representatives from each side has been constituted. It was agreed to cooperate through technical and commercial innovation and the advancement of clean energy in off-grid space. Union Minister for Science and Technology and Ministry of Earth Sciences Dr. Hasrh Vardhan today launched the integrated ocean information services and level 3 country specific Tsunami warning services for Sri Lanka and Seychelles at the Regional Integrated Multi-Hazard Early Warning System (RIMES) Ministerial conference. Inaugurating the 2nd Ministerial conference of RIMES, he said this movement established in 2009 under the Agreement on the Cooperation on Regional Integrated Multi-Hazard Early Warning System for Afro-Asian Region, for strengthening capacity of its Member States has now grown, and achieved respectable standards. This Tsunami early warning service system was developed by ESSO-INCOIS in collaboration with RIMES. Such a service to Maldives has already been operationalized. He described RIMES as a good example, starting with humble beginnings and carrying out coordinated work in the region. The 2004 Tsunami caught us unawares – but today we are much better equipped – India has now world class – best in world early warning systems capable of disseminating alerts and warnings within 10 minutes, not only our own country but to neighbors too, he added. It is important to reach all such early warning information to end-users like farmers, fisherman and people at risk, the minister asserted. Good information, communicated in easy to use manner can impact significantly contributing to economy and GDP growth. Dr. Harsh Vardhan said that all RIMES countries could now feel proud that they are partners to this pioneering system. RIMES was established on 30 April 2009 to provide user-relevant early warning services to its Member States and others. It is governed by a Council, composed of heads of National Meteorological and Hydrological Services (NMHSs) presently chaired by India. Council decisions are carried out by the RIMES Secretariat, which is currently Maldives. RIMES programs and projects are implemented by the Program Unit, which also operates and manages the regional early warning facility, located near Bangkok, Thailand. The RIMES Council established a Ministerial Consortium for obtaining highest-level political endorsement and guidance for mobilizing resources to fund Master Plan implementation and RIMES delivery of core services. The Ministerial Consortium comprises of Ministers that have purview of the NMHS or national scientific and technical agency that generate multi-hazard early warning information in RIMES Member States. RIMES Consortium of Ministers first met in New Delhi in June 2012 and the present Ministerial meeting was the Second. Twenty-three countries were represented in the conference today, with participation of Ministers and Ambassadors, and Senior Officials. The nations represented were Afghanistan, Armenia, Bangladesh, Bhutan, Comoros, India, Lao PDR, Maldives, Mongolia, Mozambique, Myanmar, Nepal, Papua New Guinea, Pakistan, Philippines, Seychelles, Sri Lanka, Tanzania, Thailand, Timor-Leste, Uzbekistan, and Vietnam. Further, it was assured that India would continue to support RIMES in efforts to assist in providing country specific early warning services. Acknowledging the support of international agencies like WMO, ECMWF, IOTWS-IOC and UN ESCAP, he wished that the enthusiastic participation from countries and UN and other international agencies would make this successful in times to come as well. Secretary, Ministry of Earth Sciences and Chair, RIMES Council Dr. Shailesh Nayak reiterated the need for developing systems that can use state-of-the-art knowledge to serve humanity. Ministry of Earth Sciences is supporting for expansion of the targeted efforts, under RIMES umbrella, towards research, education, communication, and the application of proven knowledge science and technology. Strategic investments, of human and capital in such matters, as they relate to hazards, offer the promise of producing significant reductions in the loss of life and property from natural, technological and human-induced disasters. Mr. Murato, UN ESCAP welcomed India’s contribution to the Trust Fund and also acknowledged other donors. He recognized unmet needs and gaps, and emphasized the need for local level information and integration of these at local government level policies and plans. He commended the countries that have supported, including Government of India’s great leadership as the Chair of the RIMES Council. Maldives and Mongolia’s support as Secretariat, and Royal Thai government initial support were also acknowledged. He further assured the continued support from UN ESCAP. The 2nd RIMES Ministerial Conference reviewed the update on the status of implementation of the First RIMES Ministerial Conference recommendations and provided guidance to RIMES policies and programs and adopted the Second Master Plan for the 2016-2020 period. The conference also articulated a Declaration that further strengthens technical and funding support to the RIMES to enhance capacities of Member country National Meteorological and Hydrological Services (NMHSs) to provide standardized high-quality customized products for managing climate risks. The Ministry of Skill Development and Entrepreneurship and Ministries of Steel and Mines here today signed MoUs on Skill Development. The MoUs were signed with an understanding to collectively address the incremental human resource requirement in the two sectors. MSDE will implement this partnership through Directorate General of Training (DGT) and National Skill Development Corporation (NSDC). Speaking on the occasion, the Minister of State (Independent Charge) for Skill Development and Entrepreneurship Shri Rajiv Pratap Rudy said that the cabinet has recently approved the National Policy for Skill Development and Entrepreneurship and this will help the Ministry to bring uniformity across the skill initiatives it plans with all the Central Ministries. He said, with today’s MoUs, the Ministry is now focusing on the need for skilled manpower in the Steel and Mining industry with the help of Union Minister for Steel and Mines, Shri Narendra Singh Tomar. He said, both the Ministries will together ensure that we have standardized vocational training and infrastructure for the industry so that it becomes a self-sufficient and progressive industry and also create more opportunities globally. Shri Rudy said that the Ministry is also going to undertake 'Recognition of Prior Learning (RPL)' for around 5 lakh working in the mines and coal sector. The Skill Council for Mining Sector (SCMS) plans to upskill and train approximately 4.50 lakhs people for mining industries including 50,000 new inductees to make them employable within a period of ten years. Giving a direction to the industry’s growth, the Minister for Steel and Mines Shri Narendra Singh Tomar said, a three-layer framework for skill development should be adopted to meet the country's requirement. Firstly, we need to assess the need based skill requirements in the sectors on a short-term and long-term basis. Then we should think of requirements of upstream and downstream industry and thirdly the requirements of allied industry. He said, instead of working separately on small scale, we should work cohesively on a bigger scale. This planning is of utmost importance to meet the demand and execute skill development in a strategic manner. He thanked Shri Rajiv Pratap Rudy for extending his Ministry’s support to Steel and Mines in ensuring standardized training for the manpower in the sector. The Minister said, he will also encourage the PSUs under his Ministries to support the agreements made today. According to a report launched in 2014, adequate supply of skilled labour could pose a big challenge for the steel industry alone which will need 2.85 lakh more such workers to treble the annual capacity to 300 million tonnes within 10-12 years. As per estimates by the domestic steel industry, as India increases its capacity from around 100 MT now, an additional 2.85 lakh workforce would be required, considering the productivity at 700 tonnes of crude steel produced per person, per year. The Indian steel industry employs around two lakh people at present, including around 97,000 by SAIL itself. Factoring that 15 per cent of total manpower in a steel plant are engineers, the state-run steel firm estimates that there would be an additional requirement of 43,000 engineers in the industry by 2024-25. As part of the agreement, MSDE will set standards and quality assurance process to facilitate implementation of the projects agreed under the MoU. It will also ensure identification of relevant Quality Packs - National Occupational Standards, which will be aligned with National Skills Qualification Framework levels for various job roles in selected sectors as per the demand for the three industries. This will ensure standardized training delivery through ITIs/ATIs/RVTIs and select NSDC training partners for the industry. MSDE will also ensure assessment and certification conducted by NCVT or relevant NSDC approved Sector Skill Councils and will provide a pathway to existing and retired employees of PSUs to work as Assessor or Trainer, through relevant courses by ATIs/RVTIs and NSDC Training partners. The ministries will help facilitate the identification and optimal utilization of existing training infrastructure, maximising apprenticeship training in PSUs in coordination with DGT, as permitted under the amended Apprentices Act. These MoUs are big steps by the government to give shape to the Prime Minister’s vision of a “Skilled India” which is to be launched on July 15th by Shri Narendra Modi. The Water storage available in 91 important reservoirs of the country as on July 09 2015 was 48.51 BCM which is 31% of total storage capacity of these reservoirs. This storage is 131% of the storage of corresponding period of last year and 119% of storage of average of last ten years. The present storage position during current year is better than the storage position of last year and is also better than the storage of average of last ten years. The northern region includes States of Himachal Pradesh, Punjab and Rajasthan. There are 6 reservoirs in this region having total storage capacity of 18.01 BCM. The total storage available in these reservoirs is 8.25 BCM which is 46% of total storage capacity of these reservoirs. The storage during corresponding period of last year was 43% and average storage of last ten years during corresponding period was 35% of storage capacity of these reservoirs. Thus, storage during current year is better than the corresponding period of last year and is also better than the average storage of last ten years during the corresponding period. The Eastern region includes States of Jharkhand, Odisha, West Bengal and Tripura. There are 15 reservoirs in this region having total storage capacity of 18.83 BCM. The total storage available in these reservoirs is 5.58 BCM which is 30% of total storage capacity of these reservoirs. The storage during corresponding period of last year was 25% and average storage of last ten years during corresponding period was 19% of storage capacity of these reservoirs. Thus, storage during current year is better than the corresponding period of last year and is also better than the average storage of last ten years during the corresponding period. The Western region includes States of Gujarat and Maharashtra. There are 27 reservoirs in this region having total storage capacity of 27.07 BCM. The total storage available in these reservoirs is 6.71 BCM which is 25% of total storage capacity of these reservoirs. The storage during corresponding period of last year was 21% and average storage of last ten years during corresponding period was 29% of storage capacity of these reservoirs. Thus, storage during current year is better than the storage of last year but is less than the average storage of last ten years. The Central region includes States of Uttar Pradesh, Uttarakhand, Madhya Pradesh and Chhattisgarh. There are 12 reservoirs in this region having total storage capacity of 42.30BCM. The total storage available in these reservoirs is 12.98 BCM which is 31% of total storage capacity of these reservoirs. The storage during corresponding period of last year was 30% and average storage of last ten years during corresponding period was 19% of storage capacity of these reservoirs. Thus, storage during current year is better than the storage of last year and is also better than the average storage of last ten years. The Southern region includes States of Andhra Pradesh, Telangana, (Two combined project in both states) Karnataka, Kerala and Tamil Nadu. There are 31 reservoirs in this region having total storage capacity of 51.59 BCM. The total storage available in these reservoirs is 15.33 BCM which is 30% of total storage capacity of these reservoirs. The storage during corresponding period of last year was 12% and average storage of last ten years during corresponding period was 29% of storage capacity of these reservoirs. Thus, storage during current year is better than the corresponding period of last year and is also better than the average storage of last ten years during the corresponding period. States having better storage than last year for corresponding period are Himachal Pradesh, Punjab, Odisha, Tripura, Gujarat, Maharashtra, Uttar Pradesh, Uttarakhand, Karnataka, Kerala and Tamil Nadu. States having lesser storage than last year for corresponding period are Rajasthan, Jharkhand, West Bengal, Madhya Pradesh, Chhattisgarh, Andhra Pradesh, Telangana. States having equal storage than last year for corresponding period are Andhra Pradesh and Telangana (Two combined project in both states).